Just got off the bus from Lake Quinault. 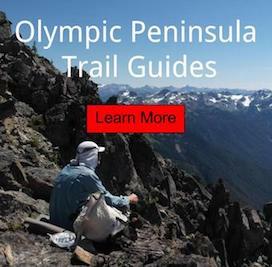 Ended up doing a 10 day high route of the Olympic National Park from north to south. My friend Steve, Liz Thomas and I did the off trail traverse from Mount Appleton to Kimta Peak of the Bailey Range. This would be my 3rd continuous trip out in the last few weeks. Those who are not familiar with this mountain range and have visited Hurricane Ridge, it runs from left to right in your view; protecting Mount Olympus. It has some Class II scrambling, few glacier crossings and not the place for someone with a fear of heights. We had a mixed bag of weather, starting off in 85+ degree heat for a few days and then turning to autumn like conditions at the end of the route; thunderstorms, lightning and just above freezing rains. In fact the most sketchy part of the trip was done in the middle of an electrical storm and heavy precipitation. All that were present, will ever forget that day! Enjoying an evening at camp. The group down climbs around a waterfall filled gully. A Mountain Goat just saying hello. Liz Thomas takes in the ruggedness of the Olympics. Looking south into Bear Glacier. Enjoying solitude with the Humes Glacier. Liz Thomas taking in her first of many sketchy snow bridge crossings, as we descend down the Elwha Snow Finger; the source of the river. Mist rolls off the Skyline, during 2.5 days of rain. I now wait to see how much snow is going to fall at 5,000', during this incoming storm. Hope the high country isn't closed for the season. Want to get one more big trip, in time for Elk rut as autumn approaches.